Summer has been starting to show itself of late here on Guernsey, and the Bella’s outside areas are once again proving popular locations for whiling away an afternoon with a cooling cocktail. We love mixing up classics behind the Bella’s bar, and the Tom Collins is about as classic as they come. It’s also a simple enough recipe that you can recreate it easily at home – perfect if you took a bottle of our latest Wheadon’s Gin expression, a yuzu, lemongrass and green tea infusion, home with you as a reminder of your visit to Guernsey’s Gin Hotel. 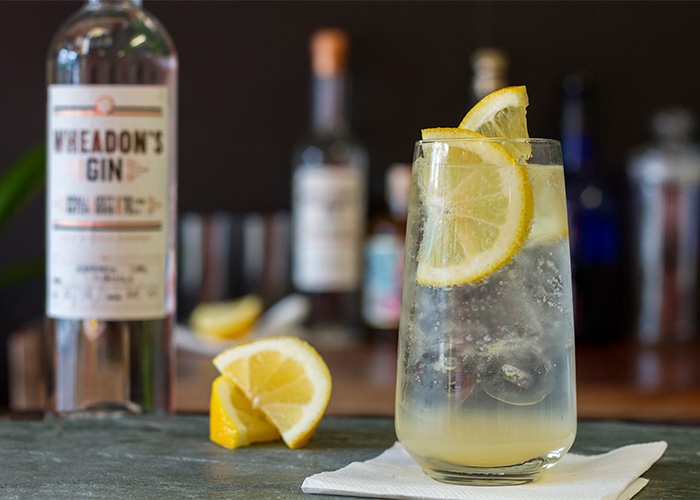 The Tom Collins recipe first appears in print in 1876, in the pages of The Bartender’s Guide (2nd edition) written by the granddad of modern mixology, Jerry Thomas. It was a class of drink combining a spirit with lemon juice, sugar (or simple sugar syrup) and soda water that has gone on to become known primarily as a gin-based cocktail, and which gave its name to the tall, straight glass that it was classically served in. The name of this soda-topped summer cooler comes from a story muddled by the mists of time, as is the case with all of the best classic cocktails. In 1874, two years before Jerry Thomas wrote down the recipe, a practical joke was circulating around New York City. The story goes that pranksters would tell a friend of a loud and obnoxious (and totally fictitious) man named Tom Collins who was sat in a nearby bar talking ill of them. The victim of the prank would rush to the bar to confront Tom Collins who, of course, did not exist but who had "just left, headed for another bar". As a result, the victim would tour the city's bars searching for Tom Collins whilst their friends sat and drank, having a laugh at their expense. This hoax was so prevalent that the story was picked up and printed by various newspapers (who missed the joke entirely), before Jerry Thomas immortalised it in a glass in 1876. "This individual kept up his nefarious business of slandering our citizens all day yesterday. But we believe that he succeeded in keeping out of the way of his pursuers. In several instances he came well nigh being caught, having left certain places but a very few moments before the arrival of those who were hunting him. His movements are watched to-day with the utmost vigilance." An alternative story links the Tom Collins cocktail to a man named John Collins who was a bartender at Limmer’s, a fashionable London Hotel in the 1870s and 80s. The mutation from John Collins to Tom Collins was suggested to be because of the use of Old Tom gin in the original recipe. Either way, the Tom Collins cocktail became enormously popular in America from the late 19th century right through to the post-prohibition years, and has endured to this day, at least in part, thanks to its simplicity. We suggest recreating an afternoon at the Bella by mixing a Tom Collins at home, or for an added touch of early summer sunshine, substituting the sugar with 25ml of elderflower syrup, and enjoying in a shady spot in the garden. Classic, classy, and cooling. What could be better? Add the gin, lemon juice and sugar to a collins glass (or a highball, if you don’t have a collins glass) and stir to combine. Add ice cubes and a lemon wedge and stir. Garnish with remaining lemon wedge, and enjoy!